While earning her PhD at Stanford, Maria hosted an annual post-Easter vigil meal. 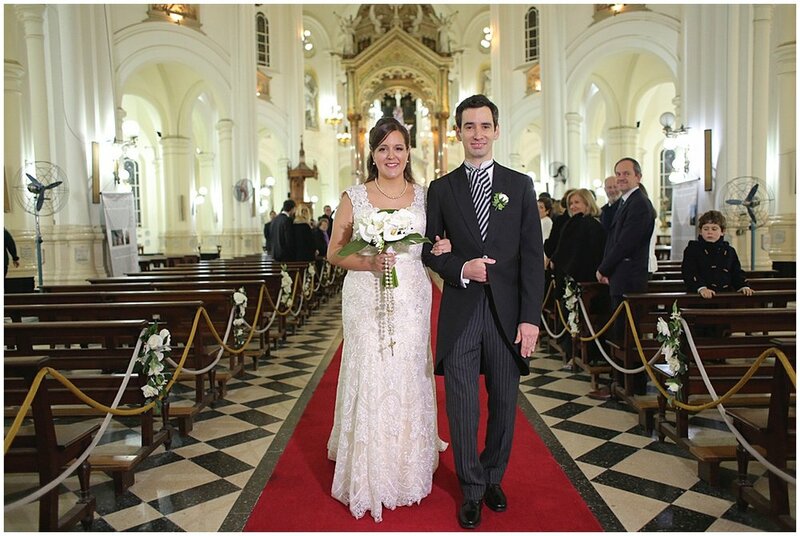 One year, mutual friends invited Santi; he and Maria met again soon after at a Catholic young adults event. Within a few months of dating, they began discussing the future. Maria knew that, with a year left before finishing her doctorate, she’d soon be looking for a job. “We both knew,” she says, “ that we had about a year to decide if this relationship was going to end in marriage. It was very quickly obvious that it was.” Santi proposed at the Fatima shrine in Maria’s Minnesota home parish. 1. 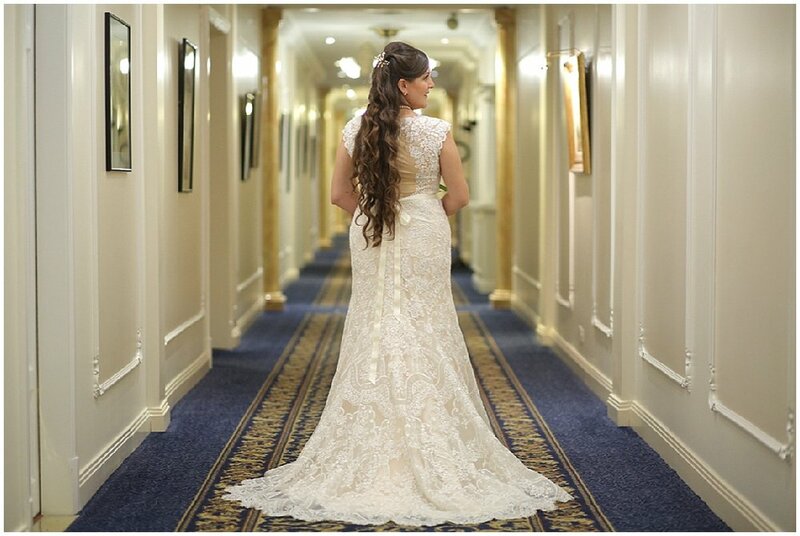 Create a magical experience for us and our guests. 2. Take advantage of this rare opportunity for our families to meet and form relationships. 3. 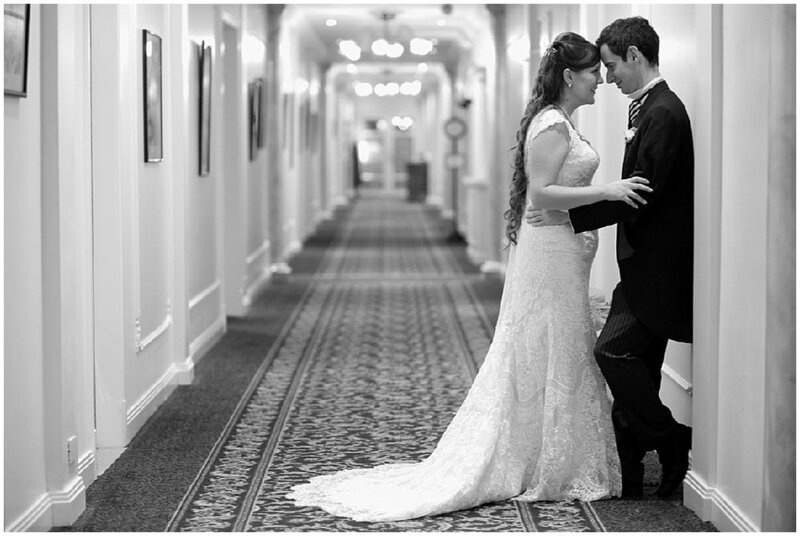 Reflect the sacred nature of matrimony, with an emphasis on selected, meaningful traditions. 4. Maintain a symmetric focus on both of us, our families, and our personalities. We spent a lot of time, energy, and money on the first two goals, trying to make the long trip to Argentina as easy and fun as possible. We developed a pretty extensive website detailing visiting and traveling in South America, both to get our guests excited and to be realistic about expenses. We set up a Facebook group as RSVPs came in, giving people a chance to introduce themselves, ask questions, and make travel plans. 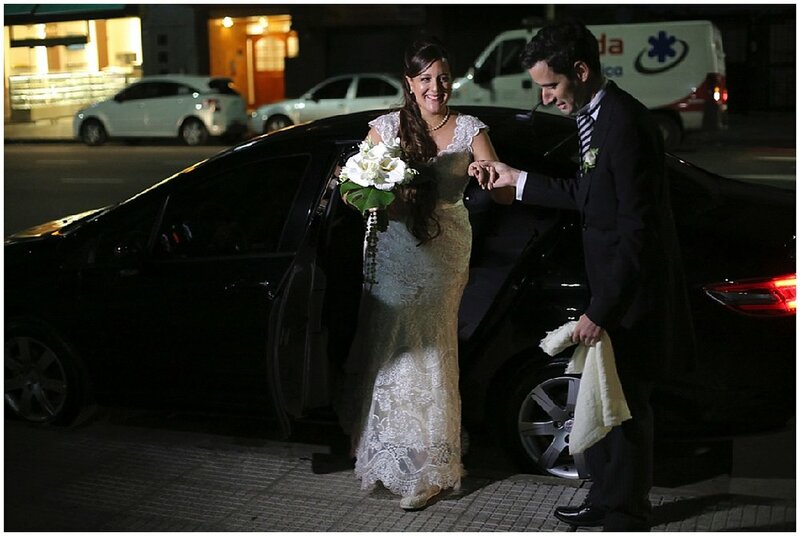 Shortly before the wedding, we also set up three Whatsapp groups for the two sides of my family and my friends, along with a few Argentine friends and family, so they could make plans on the fly in Buenos Aires and have a local resource in the days before the wedding. Finally, we arranged a series of family dinners--first with just our parents, then our parents and siblings, and lastly with my extended family that traveled from the U.S.
We paid for one of my best college friends, who had very recently been ordained to the priesthood as an Augustinian, to fly from the U.S., and one of Santi’s family members, a Spanish priest, to fly from another province in Argentina to concelebrate the Mass. They were joined by the parish priest who had celebrated Santi’s sister’s wedding, as well as the auxiliary bishop of Buenos Aires, who is a friend of his family. Coordinating three priests and a bishop--from three different countries, speaking two different languages--was very intimidating! We tried to figure out the rules surrounding bilingual services and concelebration with a bishop, although in the end the priests figured it out amongst themselves in the half hour before the wedding. 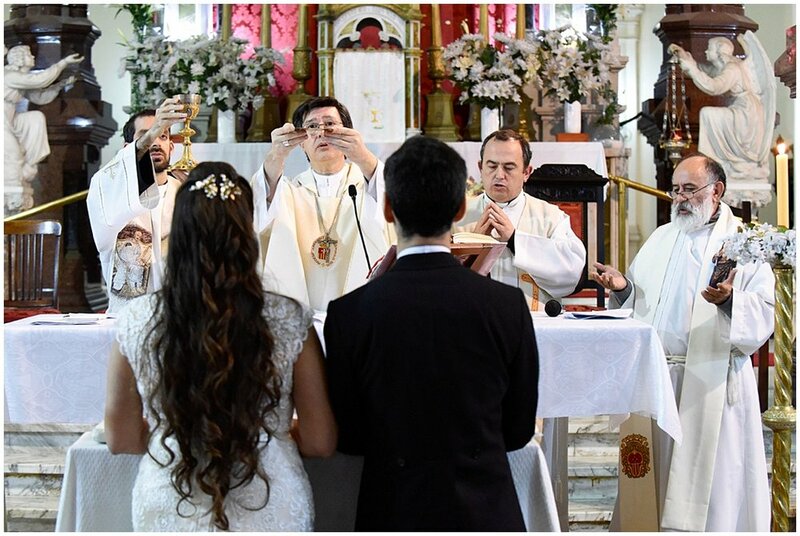 We also created a bilingual wedding program that had almost every word spoken at the Mass, along with notes on the sacrament of marriage, sign of peace, and reception of communion. The readings were in a combination of languages: the first in English, the second in Spanish, and the Gospel proclaimed with short homilies in both languages. We opted for a bilingual Psalm and Prayers of the Faithful. For the music, we prioritized songs that had translations in both English and Spanish, including “Come Thou Font / Fuente de la Vida Eterna,” “Pescador de Hombres / Lord, When You Came to the Seashore,” and “Ode to Joy / Himno de la Alegría”, along with the beautiful Argentine Mass setting, Misa Criolla. Though an organist and a soprano were already included in the fee charged by the church, we splurged on a professional choir, which was a great choice. When I heard them sing the Gloria, I knew they were worth every peso. 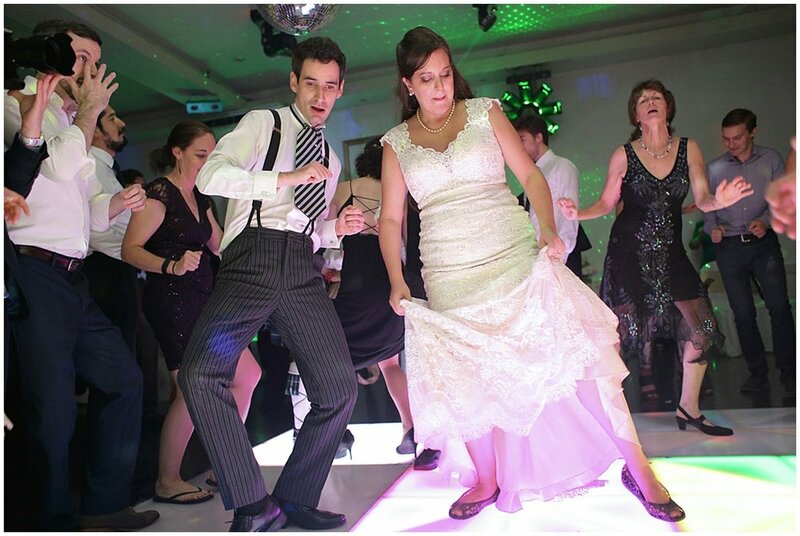 For various reasons, we decided not to have a wedding party. Instead, our parents served as our witnesses. 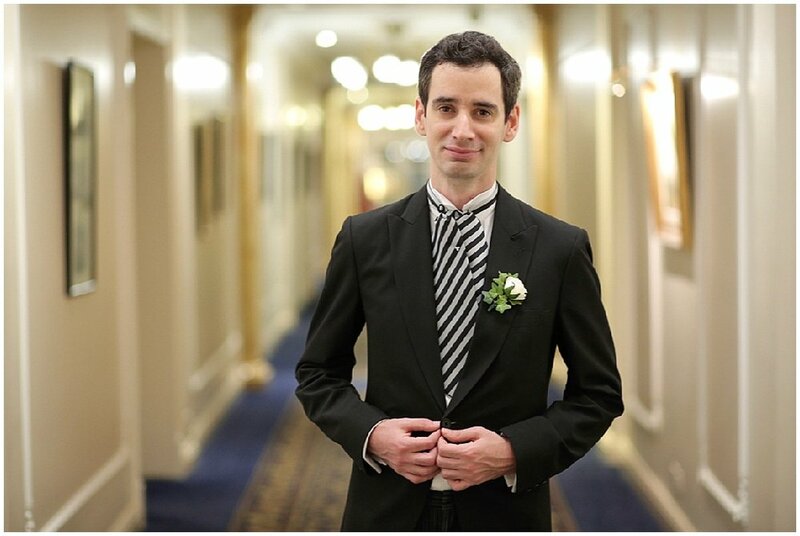 It was important to me that I not be the only one escorted down the aisle by my parents, because Santi and I were entering into marriage as equal, complementary partners, and I wanted to avoid even the appearance that I was being given away by my father, rather than entering into marriage in my own right. 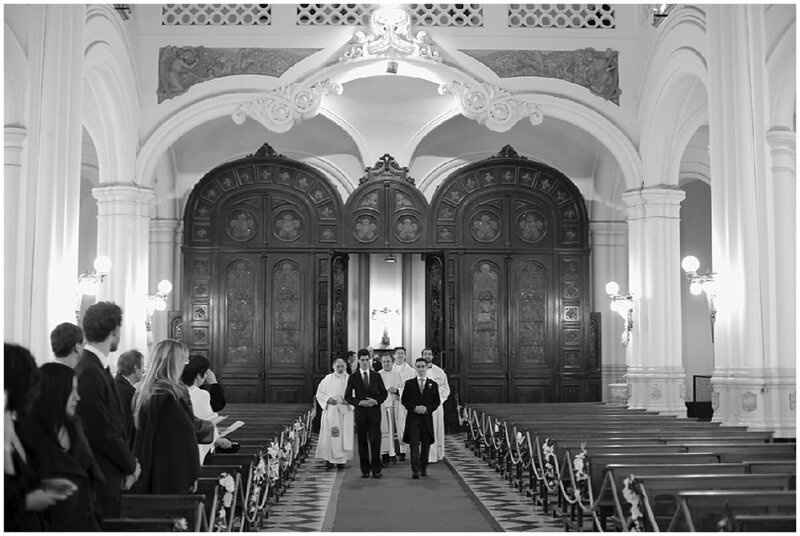 We considered several options for the procession, but in the end decided to enter together, preceded by our parents as examples of faithful marriages. This decision led naturally to us getting ready for the Mass together. I’m so happy we did that, because I know I was much calmer being with Santi all day than without him. 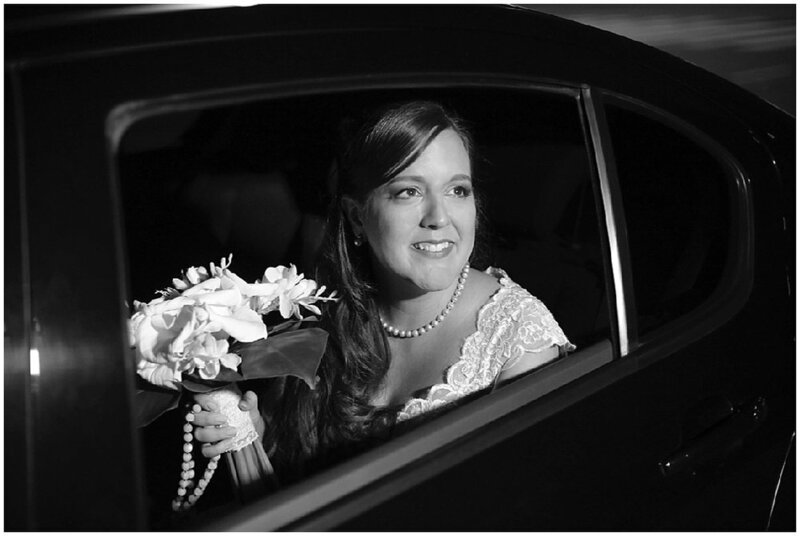 I carried a bouquet of white calla lilies, along with a nacre rosary that the women of Santi’s family have carried at their weddings, starting with his great-grandmother. Santi carried a handkerchief from my grandmother in his pocket. 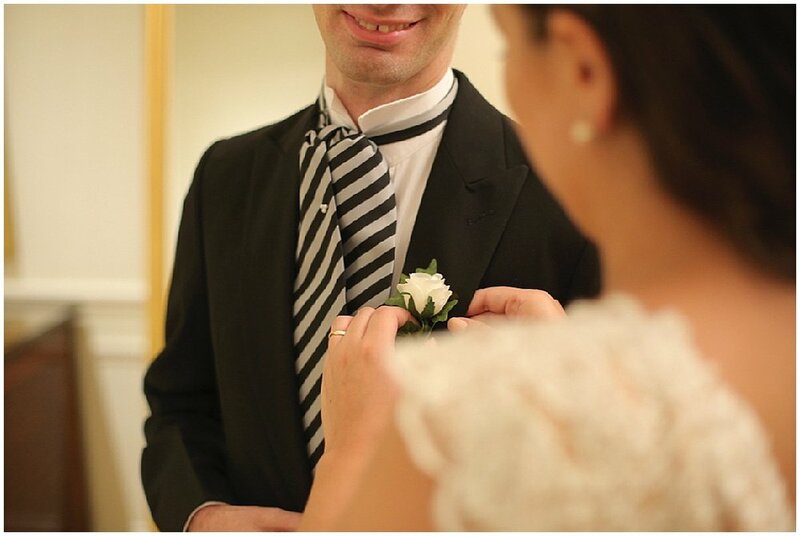 During the Rite of Matrimony, we exchanged identical rings in the shape of Möbius strips that we bought on Etsy. A Möbius strip has a half-twist, which makes it a single-sided two-dimensional figure--even more infinite than a circle! I had always wanted a Möbius wedding ring since I learned about it in high school; fortunately, I married a nerd who also loved the idea! After communion, we presented flowers to Our Lady of Mercy, the patroness of the Mercedarian order whose church we were in, and prayed for her blessing on our marriage. Most things happen later in Argentina than in the U.S. After the wedding Mass, which started at 8:30pm, we had an all-night party. We took immediate family portraits during the cocktail hour, which was followed by about seven hours of alternating dance sets and food: an appetizer, main course, dessert, cake and a champagne toast, and ending with pizza at 6:00 A.M. for those who could still eat. 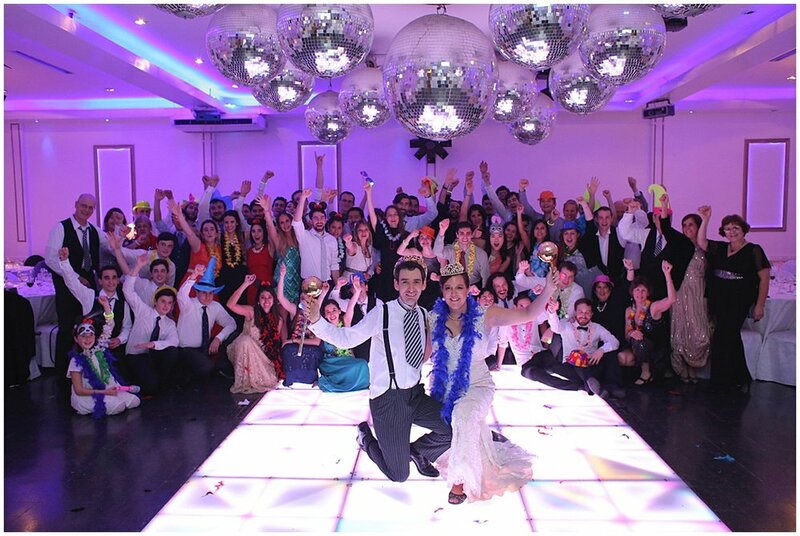 I think this schedule, with built-in breaks to recover energy before dancing more, was the reason half of our guests lasted the whole night, until the final photo! 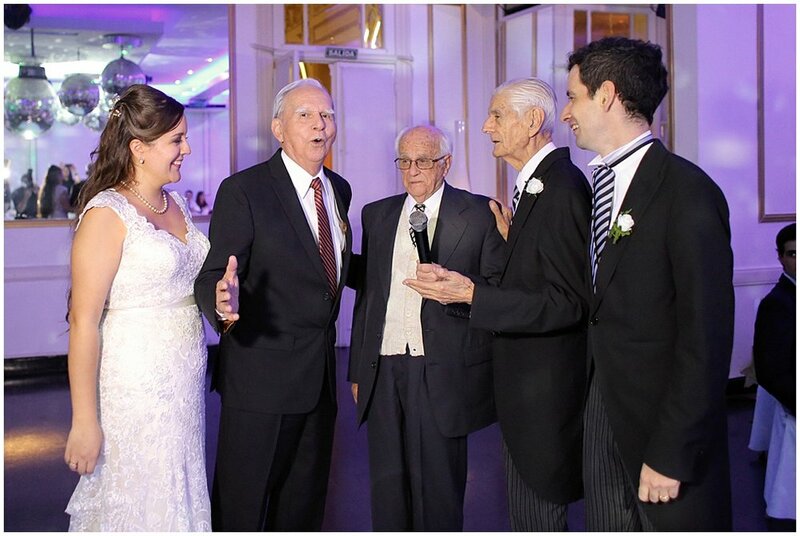 Another special moment was when we called our grandfathers up to sing together. My grandfather is Mexican and had lived for several years in Uruguay, so he shared a love for boleros and tangos with Santi’s Argentine grandfathers. It was so special to see the joining of families in this way! 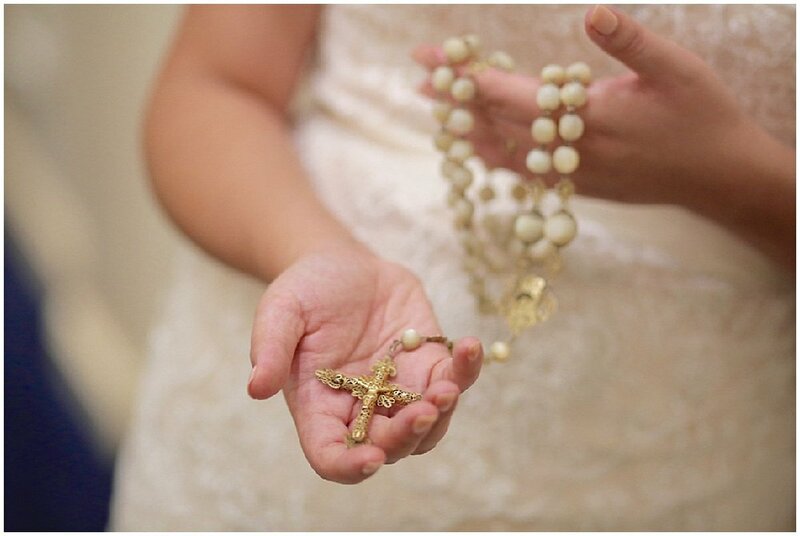 Maria’s spiritual take-away from her wedding day: We really enjoyed the process of planning our wedding Mass. We read through the Together for Life book, taking a few weeks to cover each option for the readings, along with the commentary, and discuss them. We also were very fortunate to do our marriage prep with a deacon and his wife, another couple that we knew who were also preparing for marriage. 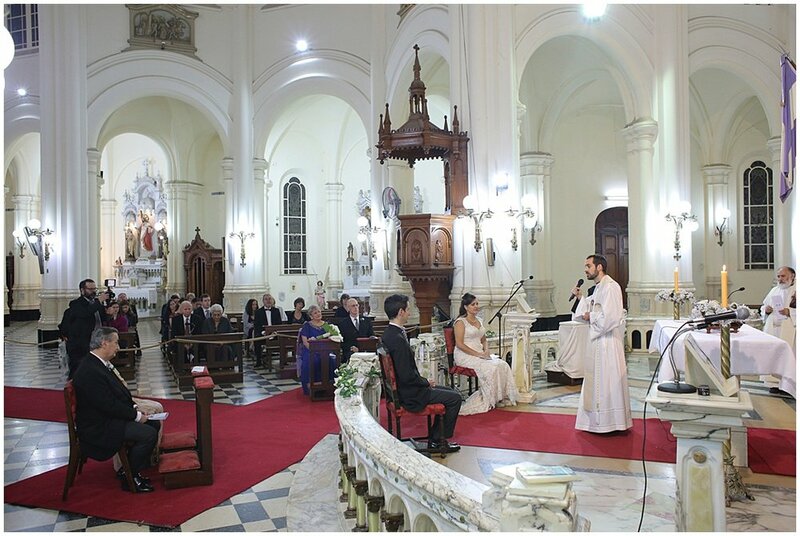 It was so special to me having my close friend, now a priest, concelebrate our wedding Mass. He had been ordained only three weeks before, and I was so grateful the timing worked out and that he agreed to come. There were so many parallels: there we were, both in white, starting our vocations at almost the same time. I had been there on the occasion of his first vows six years before, and now he was there to witness mine. We had even chosen the same readings for our wedding as he had used in his Ordination Mass! 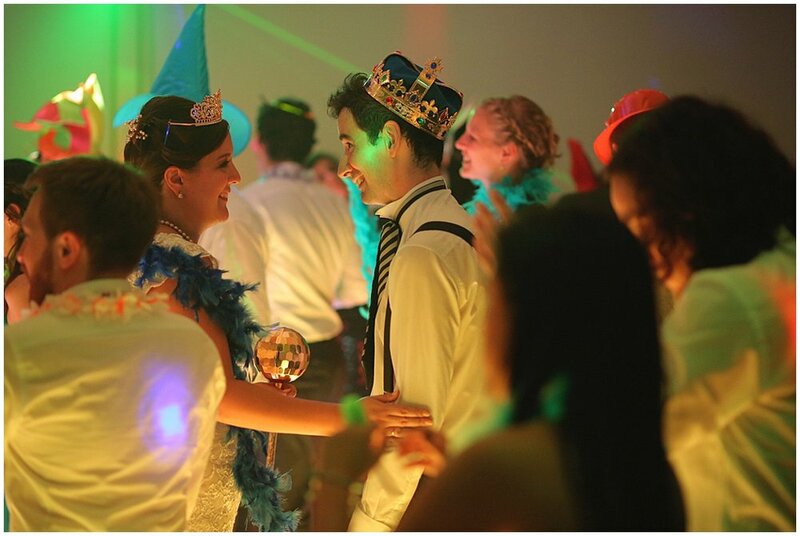 He agreed to hear our confessions the night before the wedding, which was a very emotional and grace-filled moment. At the end of the service, we had the opportunity to make a few remarks. After thanking everyone for being there with us, Santi how special it was for us to have had a bilingual wedding Mass, because it represented not only the nature of our relationship, but also the universal character of the Church.